The Harding coin cover will go on sale beginning at Noon (Eastern) on Thursday, February 27, 2014. 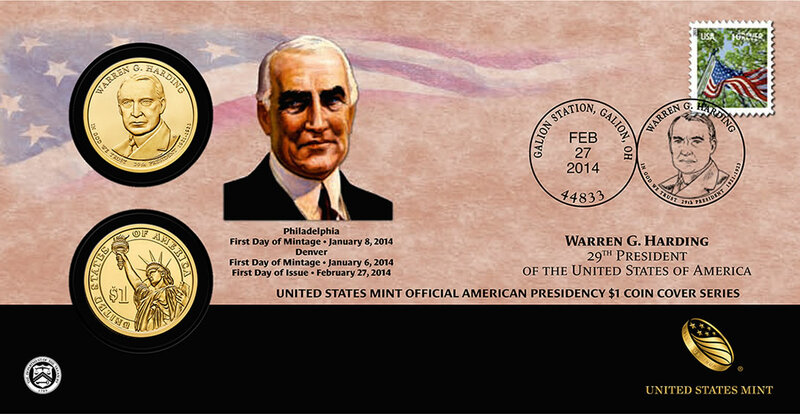 Included in the issue are two 2014 Warren G. Harding $1 Coins. The two coins are from the first day of production from two US Mint facilities - January 8, 2014 for the Philadelphia struck coin and January 6, 2014 for the coin produced in Denver. Both are affixed to a durable display card which includes an image of Warren G. Harding, the 29th President of the United States. Affixed to the front of the card is a U.S. A Flag for All Seasons (Forever®) stamp which has been cancelled with a postmark of February 27, 2014, Galion, OH. The back side of the card contains a brief biography of Harding along with a description of the date and location of production for the included coins. The coins are attached to the card in such a way as the obverse of one can be seen at the same time as the reverse of the other. 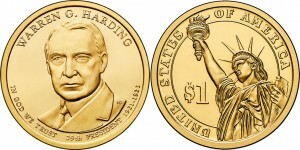 Warren Harding is the first of four former US Presidents to be honored on coins of the Presidential $1 Coin Program in 2014. Subsequent strikes this year will depict Calvin Coolidge, Herbert Hoover and Franklin D. Roosevelt. 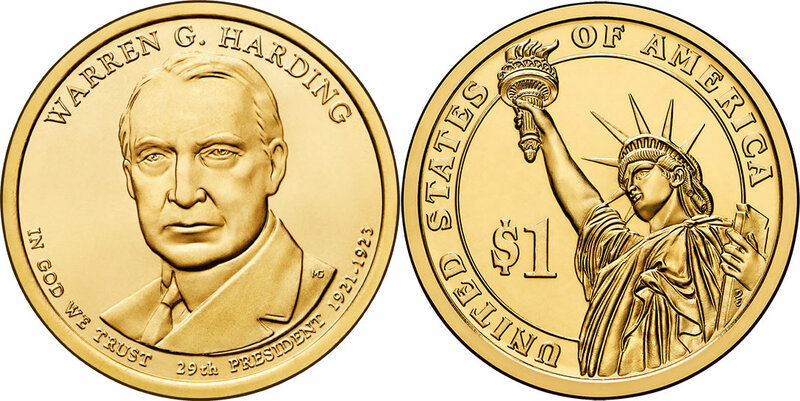 These Warren G. Harding $1 Coin Covers are available in a limited mintage of just 20,000. No household order limits apply.